If a framework encourages best practices in development while also improving our workflow, it might serve both our users’ needs and ours as developers. If it encourages best practices in accessibility alongside other areas, like performance, then it has potential to improve the state of the web. Despite our pursuit to do a better job every day, sometimes we forget about accessibility, the practice of designing and developing in a way that’s inclusive of people with disabilities. We have the power to improve lives through technology — we should use our passion for the craft to build a more accessible web. In this article, we will explore techniques for building accessible client-rendered web applications, making our jobs as web creators even more worthwhile. Consider a common form control: A checkbox opting you out of marketing email is pretty significant to the user experience. If it isn’t announced as “Subscribe checked check box” in a screen reader, you might have no idea you’d need to uncheck it to opt out of the subscription. In client-side web apps, it’s possible to construct a form model from user input and post JSON to a server regardless of how we mark it up — possibly even without a <form> tag. With this freedom, knowing how to create accessible forms is important. provide an accessible name using a <label>, with id and for attribute pairing — aria-label on the input or aria-labelledby pointing to another element’s id. Form inputs are just one example of the use of semantic HTML and ARIA attributes to communicate the purpose of something — other important considerations include headings and page structure, buttons, anchors, lists and more. ARIA, or Accessible Rich Internet Applications, exists to fill in gaps where accessibility support for HTML falls short (in theory, it can also be used for XML or SVG). As you can see from the checkbox example, ARIA requirements quickly pile up when you start writing custom elements. Native inputs, buttons and other semantic elements provide keyboard and accessibility support for free. The moment you create a custom element and bolt ARIA attributes onto it, you become responsible for managing the role and state of that element. Although ARIA is great and capable of many things, understanding and using it is a lot of work. It also doesn’t have the broadest support. Take Dragon NaturallySpeaking — this assistive technology, which people use all the time to make their life easier, is just starting to gain ARIA support. Were I a browser implementer, I’d focus on native element support first, too — so it makes sense that ARIA might be added later. For this reason, use native elements, and you won’t often need to use ARIA roles or states (aria-checked, aria-disabled, aria-required, etc.). If you must create custom controls, read up on ARIA to learn the expected keyboard behavior and how to use attributes correctly. 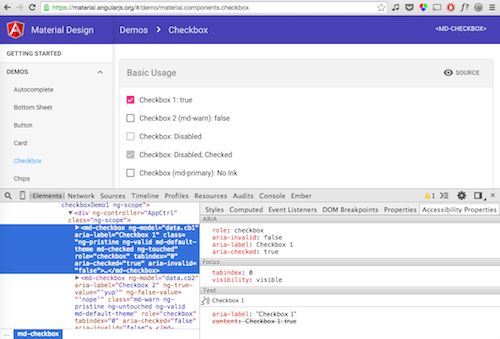 Tip: Use Chrome’s Accessibility Developer Tools to audit your code for errors, and you’ll get the bonus “Accessibility Properties” inspector. Small components are more reusable and easier to manage for any necessary semantics. Use native elements within Web Components to gain behavior for free. Element IDs within the shadow DOM do not have the same scope as the host document. The same non-Web Component accessibility guidelines apply. a keyboard event such as keypress or keydown to trigger callback functions. Imagine sorting a list with your keyboard’s arrow keys. If the sorting action rebuilds the DOM, then the element that you’re using will be rerendered, losing focus in the process. Unless focus is deliberately sent back to the element that was in use, you’d lose your place and have to tab all the way down to the list from the top of the page again. You might just leave the website at that point. Was it an app you needed to use for work or to find an apartment? That could be a problem. There is a debate about whether client-side frameworks are actually good for users, and plenty of people have an opinion on them. Clearly, most client-rendered app frameworks could improve the user experience by providing easy asynchronous UI filtering, form validation and live content updates. To make these dynamic updates more inclusive, developers should also update users of assistive technologies when something is happening away from their keyboard focus. In the simplified code above (the full directive and related controller source are on GitHub), when a user types in the md-autocomplete text input, list items for results are added to a neighboring unordered list. Another neighboring element, aria-status, gets its aria-live functionality from the alert role. When results appear, a message is appended to aria-status announcing the number of items, “There is one match” or “There are four matches,” depending on the number of options. When a user arrows through the list, that item’s text is also appended to aria-status, announcing the currently highlighted item without the user having to move focus from the input. By curating the list of messages sent to an ARIA live region, we can implement an inclusive design that goes far beyond the visual. Similar regions can be used to validate forms. For more information on accessible client-side validation, read Marco Zehe’s “Easy ARIA Tip #3: aria-invalid and Role alert” or Deque’s post on accessible forms. So far, we’ve talked about accessibility with screen readers and keyboards. Also consider readability: This includes color contrast, readable fonts and obvious interactions. In client-rendered applications, all of the typical web accessibility principles apply, in addition to the specific ones outlined above. The resources listed below will help you incorporate accessibility in your current or next project. It is up to us as developers and designers to ensure that everyone can use our web applications. By knowing what makes an accessible user experience, we can serve a lot more people, and possibly even make their lives better. We need to remember that client-rendered frameworks aren’t always the right tool for the job. There are plenty of legitimate use cases for them, hence their popularity. There are definitely drawbacks to rendering everything on the client. However, even as solutions for seamless server- and client-side rendering improve over time, these same accessibility principles of focus management, semantics and alerting the user will remain true, and they will enable more people to use your apps. Isn’t it cool that we can use our craft to help people through technology? 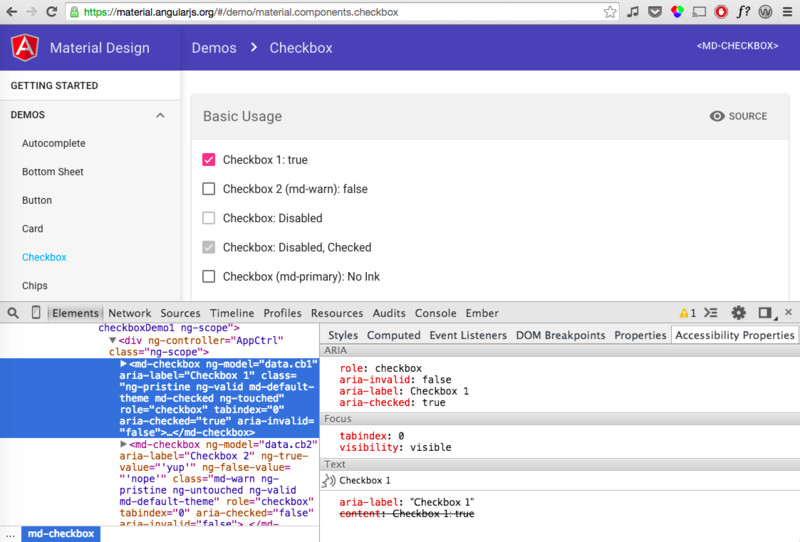 Protractor is AngularJS’ end-to-end testing framework. Thanks to Heydon Pickering for reviewing this article.